With the rise of smartphones, most of us have resorted to traveling with apparently “the whole world in our pockets”. However, as much as we all love our smart little friends, there is no denying the fact that they make us highly vulnerable to security issues like privacy invasion and whatnot. Despite several resolute attempts by the various platforms that have endowed us with our tech buddies, threatening cell phone spy software indulging in cell phone monitoring are still far from being eliminated. However, a comparison of the four biggest players of the smartphone world might help us determine which platform would be a better choice for assuring the security of one’s data. Problem solved! iPhone’s iOS 6 is equipped with a Geolocation feature which enables users to locate their phone once its lost as well as an Auto erase feature which allows the users to wipe whatever sensitive data is on the phone upon being prompted. A backup of the data can also be obtained from your computer system once the phone is restored. While Android, BlackBerry and Windows offer no such in-built feature, all platforms have supporting apps, readily available at their respective app stores, which allow their users the same facilities as offered by iOS 6. 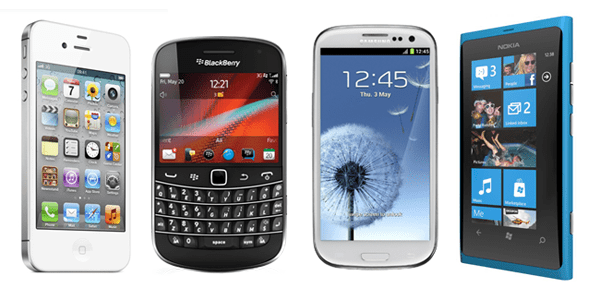 Android’s Lookout Security, BlackBerry’s BlackBerry Protect or SmartGuard, and Windows 8’s Find My Phone perform the exact same functions, if not more – such as locking the lost device, etc. Apple’s closed platform requires all iPhone apps to be in accordance with the continuity of its operating system which results in higher security and a more stable environment since very few customization features exist, if they do at all. Hackers’ access to the iOS 6 is minimized through the operating system’s sandboxed applications which are independent of each other and can only interact with the phone features to a certain limited extent. For instance, data saved by an application will have its own isolated storage that cannot be accessed by other applications. Other features such as data execution prevention make the iPhone much lesser vulnerable to exploitation, especially by malware. Despite the advantage of a large variety of available apps offered by the open platform that Android is known for, it leaves several loopholes in its security system which makes Android more susceptible to being attacked by malware. The app approval process for Google Play, Android’s app store, is not as stringent as, say, those for iOS or Windows. Also, the platform’s option to download apps from elsewhere besides Google Play makes it easy for malware disguised as genuine software to invade Android’s operating system. The good thing about BlackBerry apps is that the platform allows users to take full control of the permissions they are allotting to the apps that they install on their phone. Also, optional as well as automatic controls hinder harmful apps from installing themselves onto the phone and limit the access that the apps have to data on storage. However, these characteristic still do not qualify BlackBerry as being hundred percent malware proof as a recent malicious malware scam has still managed to hit the BB world, disguising itself as a seemingly harmless attachment in forged emails. Not only are the apps for Windows 8 sandboxed, the operating system’s SafeBoot Feature prevents malware or any other malignant software lacking the required digital signature to harm your Windows phone. Windows 8’s Windows Defender feature also guards the system against a complete range of malware as well as spyware and adware. Apple keeps a close watch on the developers for iPhone apps by requiring them to identify themselves besides leaving a deposit before they are considered in terms of quality and adherence to the iOS 6 privacy and security guidelines. However, while these measures may not be able to prevent attacks by malware entirely, they act as a hindrance for all apart from the most determined malware authors. Windows also requires its developers to provide their credentials as well as a fee, and adapt to the Windows’ environment and their security measures. Windows apps can only be developed using .NET managed language development technologies and tools which restricts any chances of malware development or invasion. While Android serves as a great platform for creative developers, it also reflects a great lack of security. With much less oversight compared to, say, iOS or Windows developers, and a lot more independence, mischievous developers can get down to business in no time and indulge in harmful ventures resulting in the defamation of the platform. While BlackBerry has previously been the epitome of security, their efforts to make a comeback with BlackBerry 10 not only include lowering the bar of their security standards but also opening their server to allow access to Android apps. With that in mind, the question regarding BlackBerry’s security still remains unanswered and largely controversial considering that apps designed by Android developers will have access to the BlackBerry platform. Who is the Security Guru, then? It is impossible to say that mobile malware has become a myth of days gone by since it is far from being eradicated and, no matter how hard we may try, nasty malware authors still manage to stab our systems with their weapons. However, the least we can do as users is choose a platform that makes us least susceptible to such attacks for which it is essential that the operating system that is being used is uptight about security. Given the circumstances, it is best to go for a closed platform like that supporting an iPhone or a Windows phone so that the user stands minimal chance of being exploited.